I recently had a very busy artsy and fun weekend, which started on a Thursday earlier this month with a gallery opening in Long Island City. My friend Laura Bell had a large painting in a flower-themed show at the Art-o-Mat gallery on Vernon Blvd. I always love going to these events when I have a friend who is part of the show, it just makes it even more exciting. Coincidentally there was a man there who had been in my voice over class. I saw him come into the room and recognized him, but didn’t know why! Later, he reminded me where we had met before. He and his wife live nearby in Greenpoint, so they decided to stop by the gallery opening after work. On Friday, Laura along with Mary Lyn and Betty joined me for an art event of my own; I had two framed illustrations in a one-night show at the YMCA in Park Slope. I really appreciated having them along for support and companionship. The turn out was low because of the heavy rain falling that night and not many of my friends were available that night. Kurt and Elaine were there, though. 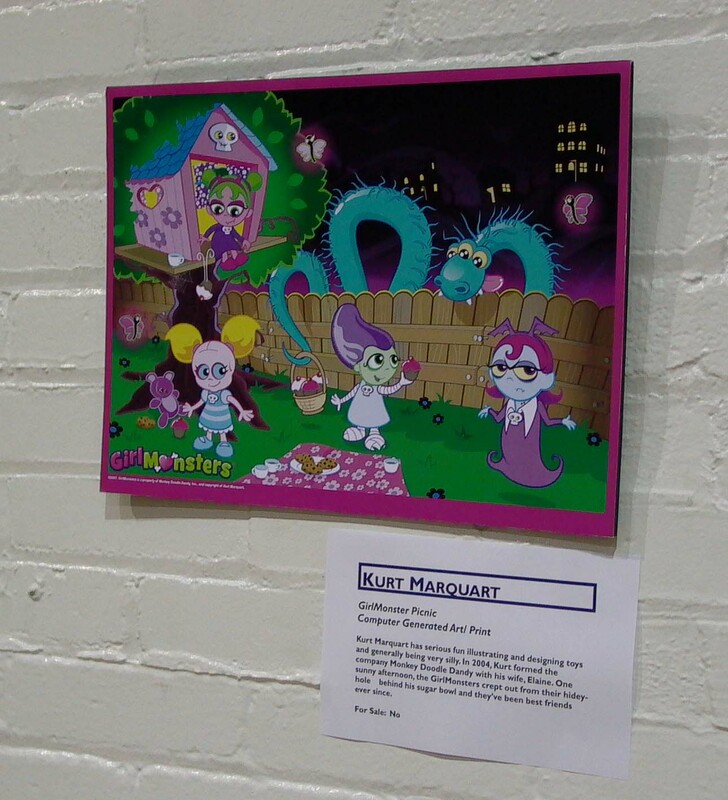 Kurt also had some Girl Monsters art in the show, and the kids really loved the coloring books he brought for everyone to take home. I am a member of the Y, but it was Elaine and Kurt that let me know about submitting my work. Sandy, a woman who lives in their building, organized it. Now I bump into her all the time when I’m there to work out! 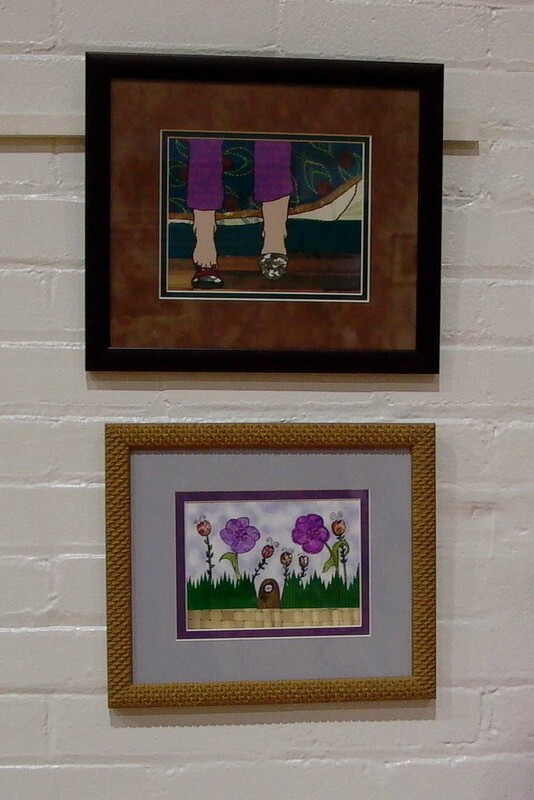 Two of my illustrations in the show at the YMCA. 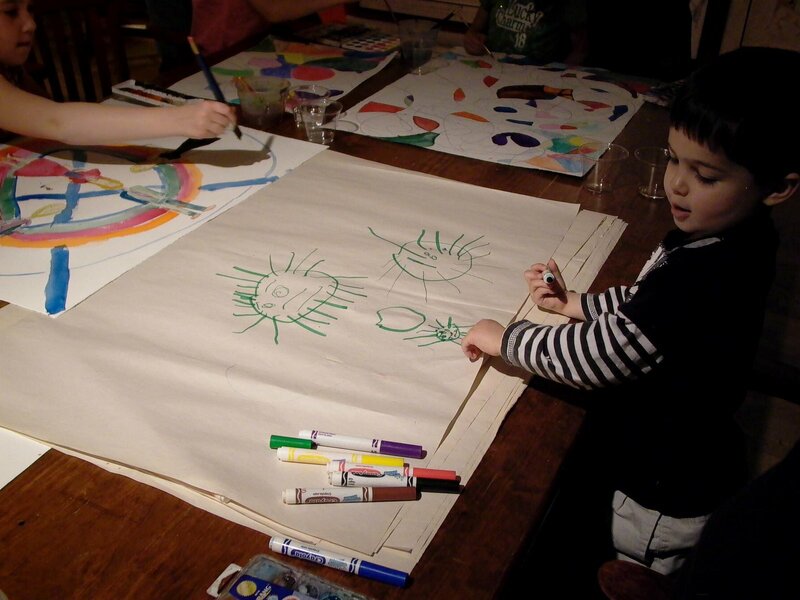 The next art event was on Saturday at 11am. I met Tara, Paul, and their adorable kids Abby and Griffin at the studio of Alex Beard. He is very generous with his time and space by having it available to any families who want to stop by on Saturday morning and paint or draw. Both of the kids enjoy drawing and coloring, but this was up Abby’s alley in particular and I was really amazed at how well she composed her drawings. 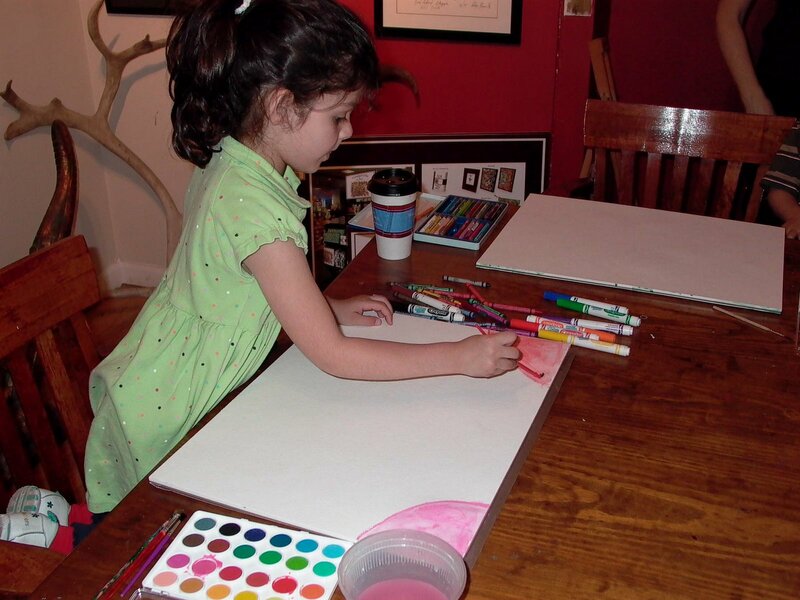 He gave her a large piece of watercolor paper and she really seemed to have a plan for the whole page, she didn’t keep her drawing in one area, but really used the whole surface. Believe it or not, there’s still more art to talk about…. once Tara & Co. were on their way home to NJ, (around 2?) I stopped into Pearl Paint to buy some new pencils because the ones I had at home were getting smaller and smaller. It was a peaceful part of the day, not many people seemed to be shopping for art supplies, so I took my time and tested out stuff I had no intention of buying just for the fun of it. Then, again, up pops Laura. She and Jean both had work at an opening in a restaurant near Jean’s studio, La Vuella Bistro. (5pm) We marched onward to celebrate with mojitos and met up with Dirk (Jean’s husband) and Bob (Laura’s husband). 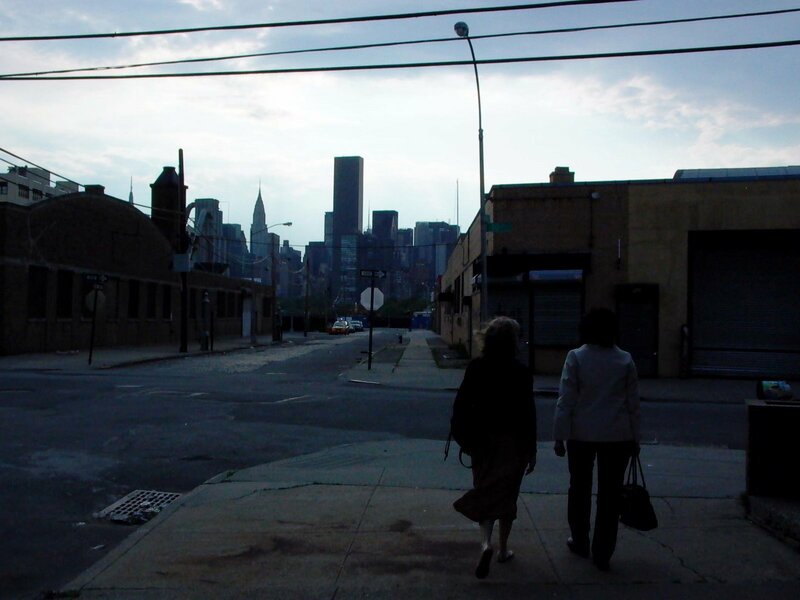 Laura and Jean lead the way to La Vuella Bistro. Laura, Jean, and I, with Jean’s art on the wall next to us! 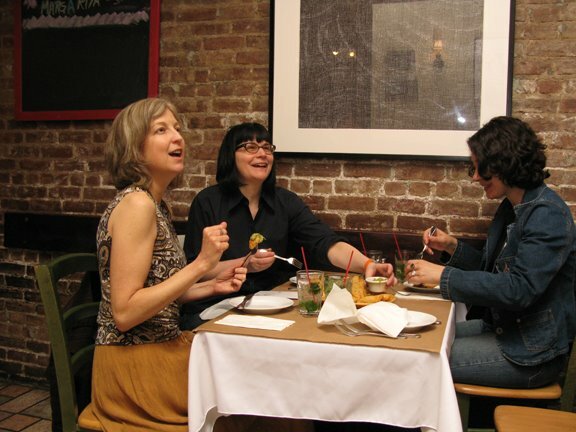 At about 7pm, Jean and Dirk announce that they need to make an appearance at a performance art opening at a gallery nearby, so the rest of us decide to tag along and grab dinner some place else afterwards. I know I wasn’t the only one sad to leave the delicious sights and smells coming from the other tables at La Vuella, right Bob? I recommend the empanadas, if you ever have a chance to stop by. The performance was a quick stop, I think the guy’s name was Larry something. He was making fun of the big art auctions at places like Sotheby’s. I must have been getting tired around this time because some of the finer details are escaping me! We trudged on back to Vernon Blvd., and ate dinner at a Thai restaurant where Laura narrowly escaped death, thanks to me having Benadryl handy. I sleepily hopped onto the 7 train to begin my ride back to Brooklyn and got home at 11pm. I thought about how days like this one are the reason I live in NYC! I really love being able to saturate my schedule with the kinds of things I talked about here. It doesn’t often happen that I have so much art packed into 3 days, but I’m really glad that it worked out so well and that I just have the opportunity to do this kind of stuff. Yep, that’s what I truly love about New York—all of the options and varieties of artistic expression and exhibition, all happening simultaneously, all the time! I went to a Syracuse University sponsored event this week at Lubin House, their NYC headquarters. Every year the Visual Communications (Ad Design, Illustration and Commercial Design) professors bring the graduating seniors’ portfolios to New York for a couple of days. Alumni and industry professionals attend, give feedback on the work, and sometimes hire students. I haven’t been to this event in a few years, and I was glad I went this time because being at Lubin House always brings back memories of my early days of being an artist. When I was in high school, I lived in New Jersey and brought my portfolio to Lubin House for my SU admissions portfolio review. I still remember the exact room my appointment was in and what the woman who interviewed me looked like. Being amongst fellow illustration alumni and professors also makes me nostalgic for the time my portfolio was there. I remember being quite disappointed with the lack of comments and job offers! I made an effort to leave comments, even though I am not in a position to hire anyone, and there was some really great work there. The best part of the evening was having some time to chat with some of the people who were in the program at the same time as me and compare notes about what it’s like in the real world. Many of us have gone in different directions and learned new skills to keep the money coming in. I remember how hard it was, starting out after graduating. It is still hard to keep on track with what I want to do with my art (creating more of it, marketing it, and continuing to learn), while making a living, and having a social life, but at least now I have the wisdom that comes from persevering this long. My attitude is much less dramatic than it was in my mid 20s, but at times that can lead to complacency. Its just a different kind of struggle than it was back then, but better in different ways, too. Group art show in Brooklyn! I will have 2 illustrations for sale in a one-night only group show at the Prospect Park YMCA on Friday, May 16. The theme of the show is “Friday Family Artist Festival.” From what I understand, the artwork is not necessarily themed for kids, but the show is being presented to expose children to local talent. There will also be live music which will probably be geared more towards the kids (The 21st Street Dads are one of the acts) and a local hot dog vendor, Willie’s Dawgs, will be on site. I’m very honored to be invited to be in the show, so bring a kid, if you have one, and enjoy the fun. You do not need to be a member of the Y to attend. Location: Prospect Park YMCA, 357 9th St., Brooklyn. Between 5th & 6th Ave.